The World Junior Championship is just 12 days away. As the tournament nears, the news will begin to pick up in a big way and you’ll be trapped in a WJC whirlwind. Not a bad whirlwind to be trapped in. The excitement this tournament has begun to create in the United States among the most die-hard hockey fans has been really great to see. It’s only a matter of time before this becomes more of an event for American hockey fans at large. Defenceman Justin Faulk’s availability for Team USA is still up in the air. He’s playing big minutes for the Carolina Hurricanes and has looked as though he is more than capable of retaining a full-time position with the Carolina Hurricanes. When USA Hockey announced its pre-tournament camp roster, Faulk was on the list. According to Jim Johannson, Team USA’s general manager, it has been made known to Carolina that USA Hockey would like to see Faulk in the pre-tournament camp. Obviously USA Hockey would prefer that Faulk be in camp, but if Carolina won’t release him until the tournament, that might be a bullet Team USA has to bite. Having him at all makes them a better team. So even if Faulk is unavailable for camp, he’ll probably still be on the roster if Carolina is willing to release him at all. So much for that. As for the World Junior, Faulk said he has spoken with Ron Francis, the Canes’ director of hockey operations about the team allowing him to compete again for Team USA — Faulk was on the U.S. team last year and has participated in the U.S. National Team Development Program. “(Francis) asked me if I had any preference on it and I said I didn’t really want to be the one making that decision,” Faulk said. “I’ll leave it up to them. “I will never, ever be disappointed to play for USA Hockey. I’ve played for USA Hockey the last three years of my life and played on the U.S. team for two years. If I get a chance to wear the jersey it’s obviously a thrill for me. It’s a smart move on the part of Faulk to leave it in the hands of the guys who are paying him. To say this is an easy decision for Carolina would be wrong. There are benefits to releasing Faulk and benefits to keeping him. It’s up to Carolina to determine what is best for one of its top prospects. However, I spoke with a gentleman at Monday’s U.S. Hockey Hall of Fame ceremony who has a very close knowledge of this tournament and he made an awfully compelling case for Faulk to join Team USA. That got me to thinking. Could it be potentially beneficial for all parties if Faulk were released? Right now, Faulk is playing big minutes as a rookie defenseman, however, he is not exactly playing a featured role. On Team USA, Faulk would undoubtedly log the most minutes of any defenseman, likely in the 25- to 27-minute range, perhaps more. He’d be on the first power-play and penalty-kill units and would play in most key situations. Additionally, Faulk, as a returning player would be a leader on Team USA, perhaps even serving as a captain. He’d spend 11 days in a pressure cooker, playing a key role on a very talented hockey team. The World Juniors could be a developmental step forward for Faulk as he’s put in situations he probably wouldn’t be right now in the NHL, particularly in meaningful games. The Canes have to decide if they can go without their young defenseman, as their blue line is already thin, for an extended period of time. If Faulk is released for Team USA’s camp, he would miss no less than nine NHL games. If he’s released to the team, but not for the camp, he’d miss five or six games. Will missing five to nine NHL games set him back in his development? Probably not, but it is still a significant amount of time. It is not an easy decision and Carolina has said they’ll wait until the last possible second to make the call. So the waiting game is still on. Tampa Bay and Anaheim released Brett Connolly and Devante Smith-Pelly, respectively, to Team Canada this year. Will Carolina be in the giving spirit this Christmas? One thing is for sure, and this is probably the most important part, Faulk is in a win-win situation. Whatever decision that comes will have been made with his best interests in mind. For a kid who’s lifelong dream was to play in the NHL, he will do what he has to do to continue living that dream. No matter what happens, he’ll be able to reap some kind of benefit and that’s what this is all about, helping kids get to the NHL and stay there. That’s the goal of any hockey organization — help players advance. [UPDATE] Further complicating this situation, Carolina announced today that forward Jeff Skinner and defenseman Joni Pitkanen are sidelined indefinitely with concussions. Carolina may not be in a position to release Faulk as its regular lineup continues to dwindle. That said, if the organization feels like the WJC would be good for Faulk’s long-term development, they might still consider sending the youngster. So a difficult decision just got more difficult. Earlier Wednesday, Hockey Canada unveiled its final roster for the 2011 World Junior Championship and as expected, it’s a pretty good list. Canada boasts 12 first-round draft picks, including five of its seven defensemen. Two of Canada’s forwards, Brett Connolly and Devante Smith-Pelly, were released by their NHL clubs to go to the tournament. Four players return from last year’s silver-medal squad, inlcuding Mark Visentin, Jaden Schwartz (Colorado College), Connolly and Quinton Howden. The goaltenders are Visentin and Scott Wedgewood. While the Canadians have loads of firepower on defense and at forward, goaltending is thought to be the weak link, just as it was last year. However, what’s past is past and everything changes as soon as the puck drops on a new tournament. Expect the more experienced Visentin to carry the load. 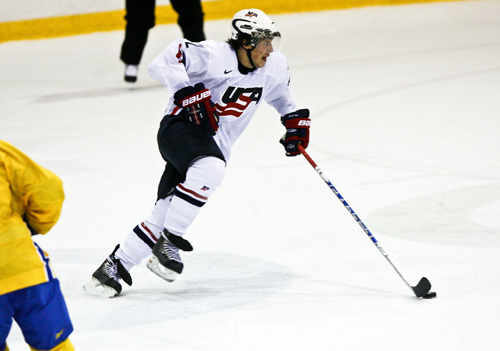 The defensive corps includes Jamie Oleksiak who decided to play for Canada in the off-season despite playing most of his key development years in the United States and having represented Team USA at a few non-IIHF tournaments. The Dallas first-round pick is a big body on the back end. The remaining defenders include fellow first-rounders Brandon Gormley, Dougie Hamilton, Mark Pysyk and Nathan Beaulieu. Additionally, likely 2012 first-rounder Ryan Murray and 2011 second-round pick Scott Harrington round out the defensive corps. At forward, Canada brings the aforementioned Schwartz, Smith-Pelly, Connolly and Howden. Rounding out the forward group are Michael Bournival, Jonathon Huberdeau (1st rounder), Brendan Gallagher, Freddie Hamilton, Tanner Pearson, Mark Stone, Ryan Strome (1st rounder), Mark Scheifele (1st rounder), and Boone Jenner. It should be noted that there are some injury concerns about Huberdeau and Howden, so there’s still a chance Canada’s roster could change. Obviously, Hockey Canada has plenty of time to sort that all out. Canada has a good mix of skill and grit up front. You can always expect Team Canada to bring a line that has one purpose and one purpose only… hit everything you see and intimidate. It’s worked for them in the past. Then there’s plenty of goal-scoring talent in the top-nine forwards. This will be a talented group, but not unbeatable. Now the U.S. knows exactly what kind of team they’ll face on New Year’s Eve. Well, if you’ve been patrolling Twitter the last few days, you’ve likely already seen Jack Campbell’s goalie mask for the 2012 IIHF World Junior Championship. If not, you’ve simply got to get a look at this beautiful Captain America design by Campbell’s go-to mask painter David Gunnarsson. Campbell has worn a different mask in each of the World Junior Championship’s he’s participated in. This is undoubtedly the best one yet. It’s not up yet, but NHL.com will have a USA camp blog available at this link. The boys over at NHL.com are always a great follow for this tournament, too, especially Mike Morreale and Adam Kimelman. For some of the most comprehensive WJC coverage in the blogosphere (is that still a word? ), Buzzing the Net, Yahoo! Sports’ CHL blog is a must read. Chris Dilks over at Western College Hockey Blog will often give his take on the happenings of the WJC. Often one of the funniest, meanest blogs on the planet when it comes to the World Juniors, The Sleeping Giant offers an entertaining look from the American perspective. It’s run by noted Americans, Ryan Lambert, of Puck Daddy and Pittsburgh radio infamy and Chemmy of the fantastic Maple Leafs blog, Pension Plan Puppets. It’s your one-stop shop for staunch nationalism and jingoistic taunts. It’s kind of a joy, unless you’re Canadian. There’s plenty more blogs covering the WJC popping up around the web, so I’ll try to include some more down the line. Coming next on USofH, I’ll take a look at some of the key battles that will take place during the U.S. camp. Six players will be cut by Dec. 22, and there’s plenty of guys that will have to work harder than the rest to earn a shot. I’ll tell you who that might be soon. This entry was posted in American Prospects, Junior Hockey, NCAA, NHL, NHL Draft, U.S. National Teams, USA Hockey, World Junior Championship. Bookmark the permalink.